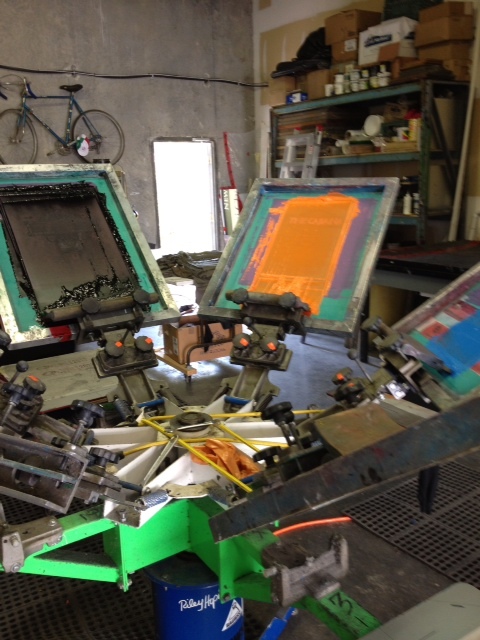 Screen printing is the process of using a stencil on a mesh screen to create an image. Ink is pulled across the screen, creating an image on the surface below where the screen allows the ink through. Screen printing can be done on a variety of surfaces including textiles, paper, wood, and plastic, just to mention a few! It first appeared in in China during the Song Dynasty (960–1279 AD). For more info, check out this great wikipedia article. Then how does it work now? There are different techniques for screen printing but in our shop, we use digital art files to create an image on transparent negative or film. This film is then used to create a stencil or screen using ultraviolet light. If there are multiple colours in the art, each colour is printed using a different screen. The cost is dependent on a number of factors, including the number of colours in your artwork and the number of items you would like printed. Please contact us for a quote by telephone 604-408-5236 or email, but you can visit our FAQ for a general idea of the costs involved.